Never heard ˈplæntn. Occasionally plænˈteɪn. Usually 'plænteɪn. And yes, in California there may be some Spanish influence, but I first learned it as the garden weed. Hmmm...I'm a "Yank" (who's up very early) and my pronunciation is /'plænteɪn/ (I think). I haven't said that word for a while. I don't ever eat them. But in any case, the final vowel is always FACE. I've never heard it reduced to [ən] or [n̩]. It's just the stressing I'm unsure about. I'm sorry. [ən] and [n̩] aren't vowels obviously, but I think you know what I mean. I'm saying I've never heard ˈplæntn. It's a word one seldom hears even now. I presume I must have heard 'pla:ntein in the past, because that is what I've always said, and I don't recall reading the word much. I have a vague impression that my early exposure to the word was in stories read on the radio with Caribbean accents — no doubt heavily modified for British listeners. I should have made it clear that I was writing about the banana-type plantain. As a word meaning a type of weed it has always washed over me, though the picture above does look familiar. One is truely famous if one is being misattributed to :). Though probably the BrE pronunciation was there at first, and someone added the US afterwards, without updating the reference. Anyway, I fixed it. [ˈplɑːnteɪn] for both meanings for me. As a kid in NYC, I always heard (and said) plænˈteɪn. It referred exclusively to the fruit; I was unaware there was any other meaning until reading this blog post. I became aware of the other pronunciations when researching BATH words. It never occurred to me that ˈplæntɪn was also an American pronunciation; possibly because it isn't a word that crops up all that much in conversation. I've no reason to doubt that it is a spelling pronunciation. But since I was a little kid in the 1960s, and learned it from older people, I'd have to say it dates back well over 50 years. Here in Canada, growing up, I knew only the garden weed, and it was pronounced with the stress on the second syllable, like the pronunciation that was new to Dr. Wells. Later we started to have the fruit in our markets, and it was pronounced the same way. I've always said /'plænteɪn/, and that's the pronunciation of the vowels I hear here in south Louisiana (where you see banana-like one regularly in supermarkets). I'll have to listen out now where my colleagues put the stress! I knew the weed first in Northern New Jersey, and called it /ˈplæntən/. When I moved to NYC and found out about the banana variety called by the same name, I pronounced it the same way. Indeed, it was a long time before I clearly understood that they were really different plants: after all, who would suppose just from looking at them that cabbage, Brussels sprouts, cauliflower, broccoli, kohlrabi, and collard greens were all the same species? I would recognize /'plænteɪn/ and /ˈplɑːntɪn/ as plausible pronunciations, but /plæn'teɪn/ just seems strange to me. The Spanish name is plátano, which I often see on signs; note the distinctly initial stress. My Oxford Dictionary of English (2005, 2nd edition revised) acknowledges both /ˈplæntɪn/ and /ˈplænteɪn/ for BrE. The Oxford Dictionary of Pronunciation (2001) does so too, and the Cambridge English Pronouncing Dictionary (2006, 17th edition) prioritises /ˈplænteɪn/ for BrE, relegating /ˈplæntɪn/ to last position and to AmE. Alex, I can never understand why people comment without reading the earlier posts on the subject:: Kilian Hekhuis said that he had fixed the misattribution in Wikipedia this morning. I too have always said /'plænteɪn/ in all three meanings JW gives, but I think I rponounced these words this way more out of ignorance than anything else. I guess if I'd been more familiar with the denotata I would have adopted /ˈplɑːntɪn/ in conformity with my BATH set and reduction practices. What I was totally ignorant of was the possibility of final stress. The View History button reveals that one Jalwikip corrected the pronunciation and added a reference. Behind the scenes, he or she supplies a link to this thread. We can even date and time the correction. Sorry, mallamb! You're right - didn't pay attention to earlier posts! Deleted mine just now! The OED Online says "Brit. /ˈplantᵻn/, /ˈplanteɪn/, U.S. /ˈplænt(ə)n/". So no second syllable stress, TRAP rather than BATH (otherwise there would be a "Brit." form with /ɑː/ too), and FACE vowel in the second syllable only as "Brit.". I'm in the /ˈplanteɪn/ camp, but that could be either TRAP or BATH. Well, JHJ, would the OED Online, particularly in its latest incarnation, persuade you to use one of those pronunciations if you were familiar with any of these things as a /ˈplɑːntɪn/? Do you think it will persuade JW to? I don't think we can congratulate ourselves on having an OED pronunciation which LPD doesn't recognize. I obviously didn't even associate any of them with 'plant' (which analogy with Plantago is apparently responsible for the n getting into the plane tree and banana versions), and I dread to think what I might have supposed the -tain to be, not to have given it a reduced vowel. Like other commenters I've always said /ˈplanteɪn/, for both the fruit and the weed. For the fruit I've also heard final stress, especially from foodies. I confess I don't think I've ever come across a version with an schwa in it. I suppose I do associate plantain with plant. That must be why I say 'pla:ntein. But despite knowing the etymology, I don't associate Plantagenet with plant, so I say ˌplæn'tædʒɪnət. I had never heard the word before coming to the US, where I hear first syllable = BATH/TRAP, second syllable = FACE. Either syllable may be stressed. David, if you know the etymology, you do associate Plantagenet with plant., so I guess the reason you say ˌplæn'tædʒɪnət is that it's not forn enough, like your 'glissando' re Nokia. It's not forn enough for me not to say ˌplæn'tædʒɪnɪt either. On the other hand 'plantaginaceous' (cf my reference to Plantago above) IS forn enough (Latin enough, I suppose) for me to say ˌplænt- in spite of the obvious association, just as I do in 'plantar' without it. No upping of the auntie intended. vp, that's a big statistic. Perhaps JW will do another survey. I wonder if anyone distinguishes the two words by pronunciation: ˈplæntɪn, a native weed; plænˈteɪn an exotic food. I associate the meanings of electric, electrician and electricity with one another, but when I pronounce one word, I am not conscious of the other two — hence my total indifference to the shared the spelling with c. It's the same with Plantagenet and plant. But for some reason when I speak of a plantain, I am conscious of the word plant. Put it down to ignorance, I suppose. As an American from Massachusetts, I've only ever heard of plantains as a fruit, and I've only ever pronounced them (or heard them pronounced) as [plænˈteɪn], or maybe [ˈplænteɪn]. @ Lazar: Yeah, I've only ever heard of them as a fruit too. Their pronunciations, spellings and etymologies seem to have been a classic case of quantum entanglement for most of their existence. Your speculation rather implies that it would be just the odd person who distinguishes them now, and I think that an oddity is what any such distinction would be. No dictionary suggests any possible ones, by the look of it. Not even David's sophisticated system of conscious and unconscious association seems to have been able to throw one up! I'm American, and I grew up with /plæn'teɪn/ for both senses, like maintain, etc., as philipnewton said. I've heard /'plæntən/ from exactly one person, but since he's a botanist, I've used it since for herbaceous plants. (He was talking about rattlesnake plantain, which some call by the slightly more accurate name "rattlesnake orchid".) On the other hand, a lunch at work recently included banana-like plantains, and I and the people I ate with pronounced them /plæn'teɪn/. So I may be a person who makes that distinction. I've been called odd before. It's very strange that on-line American dictionaries (Merriam-Webster, Dictionary.com unabridged, American Heritage) give only /'plæntən/ for both meanings, though in my experience and that of other Americans here, that pronunciation is very rare. @ Jerry Friedman: Yeah, but I noticed a long time ago that it's very common for Dictionary.com not to include the pronunciation I use for many words, e.g., it doesn't even list /kɛʧ/ for catch. 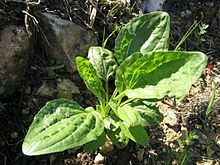 It's noticeable how many people report not knowing of the weed plantain. I have a vague memory of being aware of the word with only the haziest impression of what it denoted. This could well be a false memory. By contrast the banana-like plantain has long been a word that I recognised — originally as signifying nothing more specific than something they ate in the Caribbean. Eventually it became a word with the specific meaning or banana-like fruit, but by one which I saw in writing and seldom if ever heard. The history of a word in the language can be very different from the history of a word in the mental lexicon of a speaker. If I had had a conversation with a gardener similar to Jerry's conversation with a botanist, I might now easily be using two pronunciations. Instead of that conversation, I learned about the weed from John's posting. I still think of them as two words, though.